Large oakworm caterpillars devour all but the toughest leaf veins. An orangestriped oakworm attack left this poor pin oak naked. Last week, I passed a strangely naked pin oak tree along a roadway near the entomology building on campus. What remained of its foliage was in tatters and remnants of most leaves were reduced to mere skeletons marked by a mid-vein and a few attendant offshoots. What fate had befallen this stalwart of the tree clan? To so completely strip a tree of leaves, the perpetrator of this crime had to be either a very large herbivore roughly the size of a small elephant or a gang of very small herbivores with prodigious appetites for leaves. Seeing no signs of the former, I sought evidence of the latter and didn’t need to search too far. The ground beneath the oak was littered with thousands of bb-sized pellets, the frass (excrement) of scores of caterpillars which at one time feasted in the treetop. Thousands of frass pellets litter the ground beneath trees infested with oakworms. Some entomologists make a career studying frass and like clairvoyants reading palms, they can divine the identity of an insect by studying its droppings. Lacking such powers, I looked for more clues. Clinging to several leafless branches were clusters of papery shells, the ghosts of caterpillars known in the jargon of the entomological world as mummies. Mummies are not shed exoskeletons left behind by insects as they grow. They are the hollowed remains of insect bodies consumed from the inside out by other insects, usually the larvae of parasitoid flies or wasps. These mummies bore the telltale signs of an assassin: ragged exit wounds on their bodies. In this particular case, the assassin was likely a wasp in the ichneumon clan, parasitoids with a special fondness for caterpillars. The herbivorous agent of destruction of the oak was confirmed when I discovered a large black and orange caterpillar, an orangestriped oakworm, climbing the trunk of a nearby oak tree. Apparently, this hungry wandering larva vacated the naked oak in search of a new host bearing more tasty leaves. After its mates devoured the leaves of one oak tree, an orangestriped oakworm climbs another in search of food. Populations of orangestriped oakworm often attain outbreak levels and defoliate oaks, especially those lining streets and parking lots in urban landscapes. Communities such as Norfolk, VA and Montgomery Village, MD have developed sophisticated programs to manage these noxious defoliators using an approach called Integrated Pest Management, or IPM. By carefully monitoring populations of oakworms, selecting appropriate insecticides, and treating only trees with problems, these communities limit damage caused by these pests while reducing the number of insecticide applications and associated costs. The handsome adult orangestriped oakworm is a moth covered in fur-like scales. Like other fanciful and ferocious caterpillars we’ve met in previous episodes (swallowtails and fall webworm), oakworms are experiencing an extraordinary year. Arborists report damage to many oaks around our region. In Maryland, adult orangestriped oakworms first appear in May from pupae that survived winter and spring in the soil. 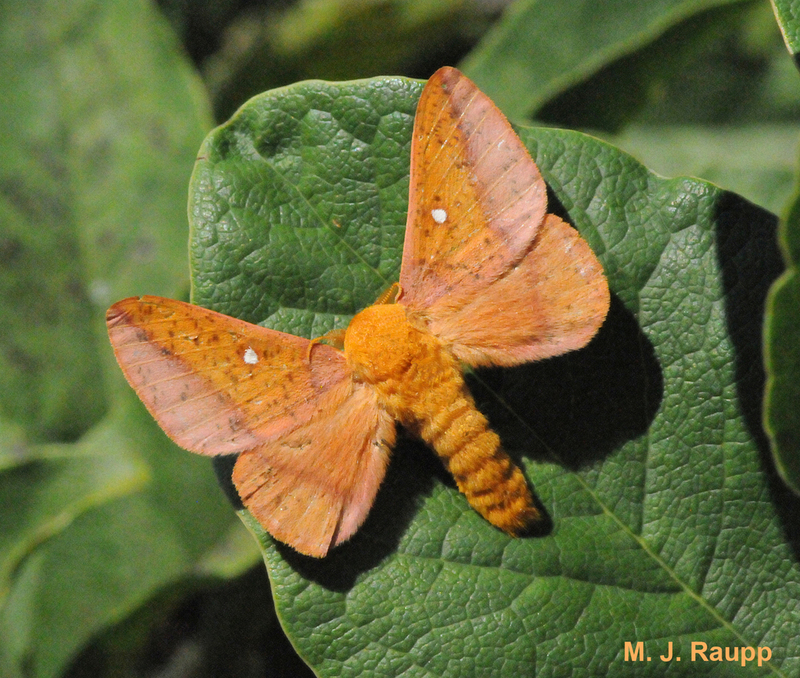 These moths mate and females lay eggs on the underside of leaves of favored hosts including oak, hickory, and birch. Eggs hatch and tiny larvae feed gregariously, first as skeletonizers removing small bites of leaf epidermis, but later by devouring leaves right down to the mid-vein. After completing development, caterpillars move to the soil to pupate and a second generation of adults issues forth to repeat the cycle. A ragged exit hole marks the spot where a parasitoid chewed its way out of this caterpillar. Fortunately, Mother Nature’s hit squad of natural enemies, including mummy – producing parasitoid wasps, helps to collapse populations of oakworms and to abate booming populations of the oak leaf eaters. However, as we move through the last few weeks of summer, don’t be surprised to see foliage of oak trees vanish before your eyes and watch out for parades of black and orange caterpillars on sidewalks beneath oak trees. The interesting articles “An Integrated Pest Management Success Story: Orangestriped Oakworm Control in Norfolk, Virginia, U.S.” by Peter B. Schultz and David B. Sivyer , and “Economic and environmental assessment of an integrated pest management program for community-owned landscape plants” by Debbie Smith and Michael Raupp, and the book Managing Insects and Mites: An IPM Approach by John Davidson and Michael Raupp were used to prepare this episode.